This is just a little snippet of our guest house, formerly the pool house. Here is the bathroom. Only the toilet is original. Funny, we didn't change that out. It got the job done I guess. We did install this arched casement window with hand-forged handles. My stepdaughter's mom gave us the chandelier. The vanity sink is a salad bowl from World Market. The shower curtain is a copper pipe bent between the two walls. 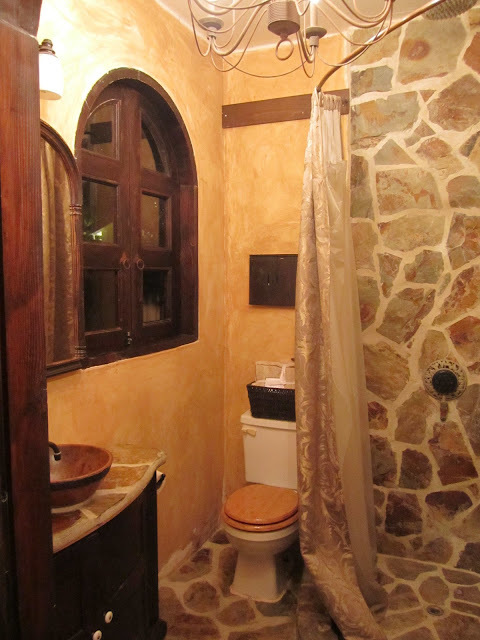 The flagstone shower has three shower heads, including a rain shower above. And we opted for a Rinnai continuous flow water heater, which allows you to adjust the temperature of your shower with a button on the wall before you get in. A nice perk: You never run out of hot water. Something about taking a shower in a stone-covered space. It feels incredible.